In her 1996 award-winning novel, Alias Grace, Margaret Atwood wrote, “I am certain that a Sewing Machine would relieve as much human suffering as a hundred Lunatic Asylums, and possibly a good deal more.” There is certainly something very relaxing about working with a sewing machine and it is very rewarding to finish a handmade project. The first patent for a sewing machine was issued in 1755, but it wasn’t until 1830 that French tailor Barthélemy Thimonnier patented his own design and opened the first machine-based clothing manufacturing company to create uniforms for the French Army. Unfortunately for Thimmonier, his workers were afraid of losing their jobs because of this advance in automation and burned down the factory. Today, sewing is making a comeback as a recreational pastime and also as a way to avoid the environmentally and economically dangerous trend of fast fashion. Thousands of kilograms of mostly synthetic textiles end up in landfills each year and are a contributing factor to global warming. Making your own clothes can help you to reduce your carbon footprint and provide relaxation through a creative outlet. There are several terms that are important to know when you are reading through this article and to better understand the differences between the various models. 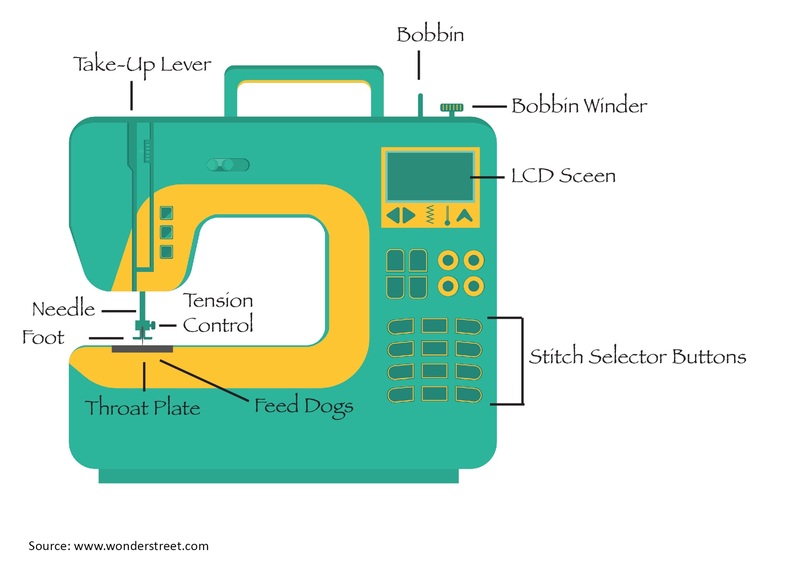 For the beginners, we’ve included a small lexicon and a diagram of the “anatomy” of a sewing machine below for your reference. Those who have been sewing for many years might want to skip this section and continue reading our comprehensive product review. A reel, cylinder or spool that holds the thread for the machine. This can be horizontal or vertical and can be wound by hand or automatically. A mechanism that feeds fabric under the needle and through the sewing machine. This is a metal plate that covers the mechanical elements of the sewing machine and provides the bottom surface for the fabric as it moves through the machine. A foot, or a “presser foot,” is an attachment that goes around the needle and presses the fabric flat to the faceplate as it is fed through the machine. Certain styles are designed to work with certain types of fabric. Many models include an interchangeable set of feet and additional feet can be purchased separately. The speed of most machines is controlled by a pedal on the floor that you press with your foot, like the accelerator of a car. Push the pedal closer to the floor, and the machine sews faster. Other machines are controlled by buttons or automatic speed controls. There are two different types of machines mentioned in this article – computerized and mechanical. The mechanical models are simpler and are generally more solid, because they do not have computers that can malfunction. However, they do not offer the same range of possibilities. The computerized models are usually more expensive, but they come loaded with features that take a lot of the tedious work out of sewing. A stitch is a loop of thread resulting from a single pass of the needle. A simple running stitch is just an up and down motion of the needle through one or more layers of fabric. All sewing machines are capable of producing a running stitch and most have special settings or programs that allow the user to make a wider variety of stitches in fancy patterns and with a variety of functions. The mechanical models usually have 50 stitches or less. Computerized models can have hundreds of options. When the machine stops, the needle is either up (out of the fabric) or down (still piercing the fabric). Some machines allow for both possibilities, while others only allow one of the two. Because the market is dominated by a few big name brands, we’ve divided this article into sections based on those brands with more specific information about the top-rated models. We are not connected to any of the brands listed. Our information and recommendations are based exclusively on consumer feedback. We offer a summary and our own suggestions in a “Final Thoughts” section at the end of this article. We’d love to hear from you! Please tell us more about your favourite sewing machine and why you love it in the comments section below. This machine is recommended for beginners because it’s easy to thread and wind the bobbin. It’s quiet, produces great stitches through several layers of fabric and has the added benefit of having a bright LCD display. Some reviewers mentioned that the foot pedal has a chrome finish, which can reflect light into your eyes if you use an auxiliary light. This is a very basic sewing machine that was designed with the beginner in mind. It is easy to start sewing, according to many reviewers who said that it took no more than 30 minutes to begin. It’s also easy to use because it does not have the same complicated options that characterize some of the other machines. It is a bit slower and louder than some of the competitors, but it makes up for these issues with a very low price. This is another machine that is best suited to a beginner. Though it’s very reliable for the first year, several reviewers noted that it is not built to last and that it can have some issues that do not arise for the more expensive, advanced models. It is quieter than some of the basic machines, and one of its best qualities is that it easily sews through thick fabric or through several layers of fabric. One of the main complaints that reviewers had about this machine is its complicated instruction manual. However, many noted that it was possible to find a number of useful “how to” videos on YouTube. Despite having “Heavy Duty” in the model name, this particular machine does not support the weight of heavy fabric. It’s recommended to rest excess fabric on the table or in a chair near your workspace so as not to put too much stress on the feed dogs. Properly cared for, this machine could last for many years without any major technical issues. The Singer 8763 Curvy machine is great for beginners because it’s very easy to thread and to wind the bobbin. It comes with a very clear instruction manual, as well as a DVD, which features many video tutorials. It is not very lightweight, but this was viewed as a positive by most of the reviewers, who appreciated the sturdiness of the machine. Because it’s a more basic machine, it does not offer much variety with regards to the stitch options available. It is also not recommended for those who switch back and forth between different types of fabrics frequently because it can be difficult to reset the bobbin’s tension. This is a vintage-styled model that has been updated with the latest computerized technology to create an easy-to-use, multi-functional modern sewing machine. Because it is digital, rather than mechanical, it is prone to more frequent malfunctions related to the computer system. However, for a beginner, it is a good choice because of its ease of use and reasonable price. It is also easy to switch fabrics back and forth because the bobbin is not so difficult to reset. Opinions on this machine are quite divided. The one thing that nearly all reviewers agreed on was that it has a very basic design. It does not have the same computerized “bells and whistles” of other models, which means that there are less digital issues to cause a problem for users. However, it also means that the machine is less versatile. Many beginners felt like the instructions were not easy to understand and had trouble threading the machine, despite it being marketed as a beginner’s tool. More advanced users had less negative reviews. Singer Special Edition is a computerized model with an LCD screen. It is not the best choice for beginners because it offers a wide and potentially overwhelming range of possibilities and customizable options. However, more advanced sewers will appreciate the versatility and many reviewers noted the multitude of decorative stitches as a selling point for this machine. One major complaint about the Singer Special Edition is that its internal parts are plastic, rather than metal, which is disappointing when the higher price is taken into consideration. This Singer model is designed for quilting. It has a large bed to support the weight of a full-size quilt while stitching and has a needle down feature that makes stitching corners much easier. It also has a self-threading needle, which some users found to be challenging. However, many more liked the added convenience. The one complaint that reviewers of all skill levels had was the foot pedal, which is not very weighted and can be difficult to control. This is a good machine for a beginner because it is easy to thread, wind the bobbin and adjust the tension. It is quite heavy, which made most reviewers feel like it was a higher quality model. The control panel with the numerous programmed stitches can be confusing, but the machine comes with a clear instruction manual and a DVD tutorial. It also has a very slow average speed, but this is not necessarily a bad thing for the inexperienced sewer. Despite advertising that it has 800 decorative stitches, several reviewers pointed out that this machine only has about 100 decorative stitches, which is less than some other models. The reason for the discrepancy is that Singer counts every variation on a stitch-type as a separate stitch. This is something that none of the other manufacturers do. This is a “heavy duty” machine that can sew through several layers of thick material without any trouble. However, it does tend to run a bit slowly. This machine is well-adapted to beginners because it’s easy to set up and begin using right away, thanks to a clear instruction manual and helpful DVD tutorial. It is easy to thread and it is quiet. It is not suitable for very heavy materials, such as leather or for stitching together multiple layers of fabric. Also, the foot pedal can be a bit too reactive, which can potentially frustrate a beginner and takes some time to get used to it. This machine was described repeatedly as a “workhorse” and is praised for its reasonable price and durability. It can easily sew through thick fabrics and through several layers of fabric, which is a big plus for quilters. However, this model does not offer a lot in the way of intricate, complicated stitches like some of the computerized machines. It performs all of the basic functions quite satisfactorily and can be expected to have a long life. Overall, this machine would be recommended for a beginner. This machine comes very highly recommended from many reviewers for sewers of all skill levels. It is a top quality model that offers excellent speed control and easy-to-use functions. The instructions are uncomplicated and setup time is minimal. This model is also very quiet. The only drawback is that the bobbins are a very particular size. It’s necessary to buy them directly from the manufacturer, so you don't have issues with the machine. Unfortunately, the Janome bobbins are slightly more expensive than other brands. This machine is another favourite. Reviewers were impressed by the number of useful stitches that the (non-computerized) model can produce. The solid construction was also noted, but several reviewers, including some that work as costume designers mentioned that the machine is also quite portable. This model only comes with a few feet, whereas some other models come with up to ten interchangeable feet. Additional feet can be purchased from Janome and are compatible with this machine. Reviewers struggled to find negative things to write about this machine. The instructions are easy to follow, but some reviewers said that they could be improved with more information about the specific stitches that the machine is capable of producing. It comes with a simple polyurethane cover and a few reviewers said that they would expect to receive a more durable plastic cover for the relatively high price of this model. However, the overall ease of use makes the Janome CXL301 a top choice for beginners, while the range of stitches is appealing to a more advanced sewer. This metal model is built to last, but many reviewers had difficulties with the bobbing losing tensions and the thread jamming up in the machine. They also complained that it is louder and slower than many other models and found the front load bobbin to be inconvenient. The bobbin is located on the top of the machine for most models, but some have it in the front of the machine, under a plastic panel, which can be difficult to remove. The placement of the bobbin on this particular machine might be at least partly responsible for the tension and jamming issues. Fortunately, the instructions are easy to read and provide a step-by-step guide to properly winding the bobbin. This machine has a lot of extra features that make for a more comfortable sewing experience. One that most reviewers raved about is the on / off button that makes the process more automatic and eliminates the need for a foot pedal. All of the parts, including the auto-threader, bobbin and foot are easy to use and easy to change or replace. The only complaint was about the tension of the machine, which requires significant adjustments, particularly when sewing a buttonhole. This machine is recommended if you’re looking for a “workhorse” that doesn’t come with a lot of extras. It’s quite heavy, which means that it can’t be transported easily. However, it is generally well made. The automatic speed control was a favourite feature. A complaint that several reviewers made is that the machine tends to drag the fabric a bit to one side and doesn’t produce straight stitches. Unfortunately, there are no instructions for how to address this issue in the manual. This machine was highly rated as a beginner’s model. The price is not very high, providing a more comfortable entry point for new sewers, and it performs basic functions quietly and quickly. It only offers 12 stitches, so this is not the machine for you if you prefer to have a bigger selection. Also, it does not handle thick fabrics or several layers of thick fabric as well as some other models. This machine is classified as “heavy duty,” which means that it should be able to sew easily through thick fabrics, like leather, or through several layers of fabric, like for a quilt. Most reviewers were pleased with the Janome HD3000’s ability in this regard. Others were disappointed and said that they had better results with other machines. It has a solid construction and the feed dogs move fabric smoothly through the machine. Reviewers also liked the convenient storage compartment at the top of the machine. Many other models have the storage compartment at the bottom of the machine and it’s not as easy to access while sewing. This machine is smaller and more lightweight than many other models. It also comes with a high-quality plastic carrying case, which makes it a lot easier to take on the go. For a computerized model, it has a rather limited range of stitches. It also does not offer a lot of extras. However, it runs quietly and is easy to use, making it an ideal machine for a beginner. Several professional sewers rated the Janome Magnolia 7318 highly and mentioned its durability as the most positive aspect. Many reviewers said that they used it for multiple hours a day and several days a week without experiencing any issues. It does not have a lot of the “bells and whistles” of other machines and it does run quite loud. However, if you’re looking for a machine that is built to last, this might be the model for you. The reviews for the Brother Innov-is NV15 are neither overwhelmingly negative or overwhelmingly positive. It’s a solid machine that makes it fairly easy to get started. However, the extra features can be complicated and the instructions are difficult to follow if there is an issue that requires troubleshooting. The auto-threader can be difficult for a beginning sewer to manage, but reviewers noted that it generally becomes easier with practice. A hard plastic cover is an added benefit of this machine. Aside from a somewhat finicky needle threader, which becomes easier to use with practice, the Brother JK4000 is a model well-suited to beginners and more advanced sewers, alike. The instruction manual is thorough and easy to understand. It is also a fairly quiet machine and, like many other computerized models, relatively lightweight. This model is inexpensive and recommended for the casual hobbyist. The quality and number of extras offered are not as high as some of the other models. For example, it does not have a very high number of fancy stitches. Additionally, the pedal is not very sensitive and the work light burns out quickly. The lamp can easily be replaced, but it is a headache if you use the machine often. It is one of the quieter models available, which is perfect for the sewer who likes to have the TV or radio on in the background. This machine is relatively inexpensive. However, unlike the LS2125l, it comes loaded with extra features, including 185 stitch programs. It also includes a set of feet, even a special kind of “walking foot,” which has an extra set of feed dogs for guidance and is used primarily to sew through thicker fabrics or several layers of fabric. It is made of mostly plastic components, which means that it is more lightweight than the metal machines. However, it is also less durable and many reviewers said that there is not enough weight in the floor pedal to keep it solidly on the ground. Like the Brother DZ2400, the BR9500PRW offers a lot of special features at a much lower price than similar models. This machine has 100 different stitches and a number of extra accessories, including a set of feet. The light on the machine is somewhat dim, so it’s recommended to use an additional table lamp to prevent eye strain. Additionally, this machine can have some issues with tension control, which may be frustrating to the beginner. This particular model is better suited to an intermediate-level sewer or for a beginner that wants to grow into his or her machine. This is another solid machine with a price that won’t break the bank. It is a durable model that is simple enough even for young students to use. Several reviewers said that it was their preferred model for the classroom. However, the auto-threader did give some users trouble, which was disappointing to many, as this was one of the main selling points of the machine. The instructions are clear and easy to read, making it less problematic to deal with issues related to the auto-threader. One of the standout features of this machine is that it gives the user an error message when the setup is not correct, so that corrections and adjustments can be made. It has a lot of additional automatic features, including an auto-threader and a start / stop button. It is not necessarily the best choice for sewing through thick fabrics or several layers of fabric and it does tend to vibrate more than other machines. However, this does not seem to affect the quality of the stitches. This machine offers a professional-grade model at a fraction of the price. It has many of the “bells and whistles” that one would expect from a higher quality machine. However, it does not offer the same level of quality. A few reviewers had issues with manufacturing defects and some said that the machine did not function well after the first year of use. Additionally, the extra stitches are not as refined as those from more expensive models. This is one of the most popular machines available on the market today with thousands of reviews online. Many reviewers said that this model is perfect for the beginner. It is easy to use and not too heavy. Some said that it was possible to lift the machine with just one hand, which is perfect if you need to move it around your house or take it to a class or sewing group. If you prefer a more solid, stationary model, you may want to consider other machines. The Brother CS6000i has 60 built-in stitches, which offers versatility but doesn’t overwhelm. It also comes with nine interchangeable feet for a variety of different projects. The ability to experiment freely with this machine is a big plus for many beginners. A bonus feature that many reviewers like is the hard plastic cover that protects the machine when it’s not in use. The price is reasonable and the instructions, which are available in English and Spanish, are easy to follow. Though it’s not a heavy-duty machine, it can sew quite easily through several layers of fabric and is well-suited to quilting. Like many other models from Brother, the auto-threader for this machine can cause problems for the more inexperienced user. However, intermediate and advanced sewers noted that the threader becomes easier to use with practice. One common complaint from users of all skill levels is the insufficient storage space on the front of the machine. Many models offer storage on the top of the machine, which can hold more equipment. This machine is one of several “Project Runway” models produced by Brother in conjunction with the popular American television program where amateur fashion designers go head-to-head in a variety of challenges to create new clothing styles. It is designed to be portable and lightweight, which is perfect for fashion students. Unfortunately, in order to make it more lightweight, a lot of the metal parts had to be replaced with cheaper plastic components, so this model is not as durable as some of the higher end models. This model is recommended for beginners, but more advanced sewers are warned that the speed may be too slow for a higher level of production. Several reviewers complained about the cheap plastic construction and did not like the storage compartment on the front of the machine, with all of the loose accessories kept in a small bag inside the compartment. The stitches are also not as tight as some reviewers would like. All in all, it’s not a bad machine for the price, but there are better models available. If you are a beginner who wants to experiment with embroidery, the Brother SE400 is a good starter machine. This machine has a very comfortable entry price. It offers only a very small embroidery area (4x4 frame), but it produces very high quality stitches. Designs can be purchased from the Internet and downloaded directly to the machine. It is also possible to periodically install updates. The Brother SE400 is a combination machine, which means that it can also be used to sew and quilt, adding some versatility. If you are an experienced sewer and want to focus exclusively on embroidery, it would be better to consider a more specialized machine. Many reviewers said that they purchased this machine for children, who had no issue operating it. However, as there is no speed control function, some homemade adjustments may be necessary to slow the machine down to a more appropriate level for a young beginner. The instructions are somewhat difficult to understand, however, the machine is very straightforward and easy to use. This machine is not recommended for beginners because it is so fast and has many issues with tension control and the bobbin that can be difficult for the new sewer to resolve. Additionally, the instructions are not easy to follow and there are not many online tutorials available. All of the functions are oriented from the left, which can be quite frustrating for the right-handed sewer. CONS: isolated issues with jamming thread or defective models. This machine is perfect for beginners. Many reviewers said that it was possible to open the box and begin sewing with this machine in 30 minutes or less. There is no need to make adjustments or complicated preparations – just wind the bobbin, thread the needle and start sewing. There are a variety of different speeds, allowing you to start slow and work up to a faster speed as you become more comfortable with the machine. It has extra features, but not so many that it’s not overwhelming to the new sewer. It is also a good pick for the intermediate or advanced user on a tight budget. Several reviewers noted that the machine is much higher quality than other beginner models. It has a robust design and will stand up to many years of use. It is fairly lightweight, making it easy to take this machine on the go. Other than a few disgruntled users who were unlucky enough to purchase a defective product, most of the feedback was overwhelmingly positive. Though it has been used successfully by beginners, this machine is more appropriate for an experienced user. Reviewers who already knew how to sew and wanted to move into embroidery had the best things to say about this model. Unlike the Brother SE400, the Designio series was designed exclusively for embroidery. It is possible to unpack the machine and begin embroidering right away and it can handle larger frame sizes. However, it is a loud machine and can be too much for sewers who haven’t had much practice. This machine is a very affordable option, but there are better models available in the same price range. It does not have a handle to allow for easier transportation, there are not many stitches to choose from and the foot pedal goes from slow to very fast with the slightest touch, which can be very frustrating for the beginner. Though it had plenty of positive reviews, it is not one of the top models in the “budget” category. This machine was recommended for beginners because it’s easy to set up and use, thanks to the detailed instruction manual and a variety of tutorial videos available online. The price is quite low, but this may be explained by the construction of the machine, which was a source of disappointment for some reviewers. Unlike some other beginner models, the Brother LS14 is made almost entirely from thin plastic. This makes it very lightweight and inexpensive, but does require some sacrifice with regards to quality. Intermediate and advanced users on a tight budget may appreciate this model, but there are certainly better value machines currently on the market. The Brother Innov-is 350SE Sewing Machine was designed with more advanced individuals in mind. Though the auto-threader and drop-in bobbin are quite easy to use and the instructions are clear, experienced users will gain more benefit from the multitude of functions. The machine is best suited for those who like to "free motion" quilt or embroider, which means that the sewer uses his or her hands to guide the fabric through the machine in many different directions. The F420 is the successor to the Brother Innov-is 350SE. For the same price, the newer model includes many additional features including a start/stop button, a tie off button and a built-in thread trimmer. The display screen is also more intuitive and easy-to-use. This model is described as being a good starter or second machine. It’s very compact size (12lbs) makes it ideal for small spaces, such as a dorm room, or to take on the go. The only thing that might hinder its portability is a poorly placed handle at the back of the machine, rather than at the top. It does not have a lot of fancy stitches to choose from and it does not seem to last quite as long as some other models, but for the price, it offers an easy-to-use alternative. This machine has a very high rating from most reviewers. It is easy to use, the instructions are easy to understand and it delivers power and precision with each stitch. However, the price may be prohibitive for individuals who are just taking up sewing for the first time. For intermediate to advanced sewers, the HZL-F600 is a top-of-the-line machine. This is another pricey, but high quality machine from Juki. Reviewers struggled to find negative things to say about this model. It has no plastic parts, which means that it is heavy, but also resilient and long-lasting. It’s not the kind of machine that you want to carry back and forth to a sewing class. Also, it does need to be oiled after every use, in contrast to other models that self-lubricate. Reviewers did not always view this as a “con,” preferring to take care of the machine manually. This machine, though well-rated by advanced and professional-level sewers, is not suitable for most beginners. It has many different functions, which provide versatility, but can slow the learning process. It's also quite heavy, making it less portable than other models. Those who like this machine commend its large throat space, which allows for freestyle quilting, in addition to many other styles and sewing techniques. In addition to 200 built-in stitches, the Husqvarna Viking Opal 690Q also offers the capability of programming customized stitches. It has an easy-to-use touchscreen with a stylus that can be attached to the side of the machine. The options can be overwhelming for beginners, but offer a great deal of versatility for more advanced users. Many reviewers commented on the contoured extension table, which is very ergonomic and comfortable when it's necessary to sew for an extended period of time. Of the Husqvarna Viking models included in this article, the Emerald 116 sewing machine is the best adapted to the needs of a beginner. It doesn't offer the same options as more professional machines and many reviewers were disappointed by the lack of a needle up / needle down lever. However, it does offer good quality for the price. It is relatively easy to use. 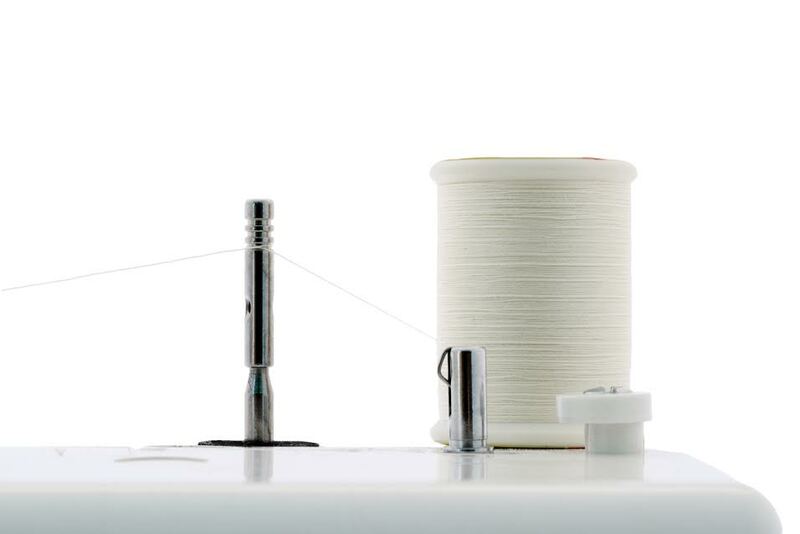 The needle is not difficult to thread, but it can be tricky to adjust the tension of the bobbin, which presents a challenge when switching between fabric of varying thickness. One aspect of Babylock that many reviewers found negative is that it can only be purchased and repaired through authorized dealers. If purchased or repaired by an unauthorized dealer or individual, the warranty on the (pricey) machine is considered null and void. However, this exclusivity does provide one very unique benefit - a complimentary introductory course. Even the most advanced sewers commented on the practicality of this offer, because of the overwhelming number of options that the Babylock Destiny Sewing Machine provides. This is not a machine for beginners, but more experienced users will appreciate the massive work space and bright LED display that reduces eye strain. he Babylock Ellure Sewing Machine offers many of the same advantages and disadvantages of the Babylock Destiny Sewing Machine, but this model is much more suited to beginners. It is also smaller than the Destiny, which means less workspace, but better portability. This is particularly useful to the sewing student, who may need to carry the machine back and forth to class. The instruction manual is easy-to-understand. The machine produces beautiful stitches without a lot of noise. This Laura Ashley machine is lightweight and portable. It’s also quite affordable. Beginners like this model for those reasons and because it’s not necessary to spend a lot of time setting up the machine before using it for the first time. The instructions are easy to understand and there are many videos online that provide additional tips and tricks. Unfortunately, this machine does not always deliver consistent quality. Sometimes it skips stitches and, like many beginner machines, it also makes a lot of noise and vibrates when the needle moves quickly. It functions better at slower speeds, which are more frequently used by beginners. It would be a suitable starter machine, but probably not well-received by an intermediate or advanced skill-level sewer. Aside from a few manufacturing defects, which are to be expected from any model, the reviews for this machine were quite positive. In addition to being easy to set up and being used right away, the John Lewis JL110 is also reasonably priced and stylish. It comes in five different colours: cornflower blue, peppermint, pink, berry and navy blue. This model does not offer a very wide range of stitch options, with only 14 built-in stitches available. It also only lets the sewer control the length of the stitch, not the width. For those reasons, the John Lewis JL110 is recommended for beginners, but not for advanced or professional-level sewers. Though the manufacturer considers this to be a machine for beginners, it does have a lot of different functions, which is very useful but can be daunting for a new sewer. It is also one of the pricier models available on the market. However, it does have a very in-depth instruction manual, which makes it easier to get started and develop the skills necessary to become an accomplished user of the Bernina 380 Sewing Machine. If we had to choose the “best in show” sewing machines for a beginner, we would recommend either the computerized Janome DC3050, the computerized Brother DZ2400 or the mechanical John Lewis JL110 Sewing Machine. All three are reasonably priced, but maintain a superior level of quality. They are all easy to use and include instructions that are easy to understand. For an intermediate or advanced computerized model, we would suggest considering an investment in the Juki HZL-F600 Computerized Sewing and Quilting Machine. It is one of the more expensive machines included in this article, however, you really get what you pay for in terms of reliability and extra features. If you are an experienced sewer who prefers a mechanical model, the Janome 525S offers a wide range of special stitches, like the computerized machines, but it is not as prone to breaking down because of its simpler construction. For the professional, we think the Janome Magnolia 7318 offers the best in terms of speed and possible level of output. With regards to specialized machines for embroidery, the Brother SE400 Sewing and Embroidery Machine is recommended for beginners who also want to experiment with basic sewing functions. The Brother Designio Series DZ820E Embroidery Machine is a more specialized alternative for the intermediate to advanced sewer that wants to focus on embroidery. Finally, for the student, we feel that the Juki HZL-27Z is the most affordable and most portable option available. It fits comfortably in a dorm room and, at only 12 lbs., can easily be carried to and from the classroom. Which sewing machine is your favourite? Tell us why in the comments section below.